Marantz NA7004 review | What Hi-Fi? The Marantz NA7004 has enjoyed a few highs and lows since we first locked horns with it in 2010. Back then its price was £700. Our opinion was more wavering and our conclusion less certain; and the streamer was awarded a complimentary four-star review. But in the face of increased competition from cheaper machines such as the Cambridge Audio NP30, Marantz took the bold step of slashing its pricing by almost £300. We therefore revised our original review to take this into account, bumping it up a star. Why? Because it’s hard to ignore the features and performance you get for the money. Like some closely priced rivals, the Marantz is a DAC in its own right and uses conversion technology found in the company’s mid-range SA-KI Pearl CD player. You can hook up external components through optical, coaxial and two USB inputs: the front one takes memory and iDevices, while the rear one takes the stream from a computer. The NA7004’s feature set is pretty comprehensive for this money. The Marantz can play content from networked computers and NAS drives and can also give direct access to streaming services such as Last.fm, Napster and BBC’s iPlayer Audio. On top of that, there’s provision for internet radio, FM/AM and DAB/DAB+ functionality. But the fun doesn’t stop there – as the Marantz is AirPlay enabled (officially it’s an optional extra, but many retailers now include it in the price), and the M-XPort modular connector on the rear means you can add a Bluetooth adaptor at a later date. The NA7004 also includes a headphone socket, complete with volume control. And there's a free control app for iOS and Android devices. However, it needs some attention. The homepage gives you access to different sources, such as internet radio, Last.fm and a music server but the styling appears dated and the whole method of operation is a little clunky. In fact, the app is disappointing, verging on the irritating – the page-based browsing system doesn't work as well as the likes of the Pioneer N50 and Cambridge Audio NP30 apps, while the search function lets you enter only the first letter of the artist or track. Otherwise you have to navigate music using a drag and release system similar to that used to refresh the pages of Twitter and Facebook's apps. We also suffered from a couple of issues where individual track info popped up on screen but only for a split second before it disappeared, leaving us with just the artwork. Disappointment with the control app aside, wi-fi and 24bit/192kHz high-res file support are the icing on the cake, but we always recommend a wired connection where possible for optimum sound quality and stability when you’re streaming. Moreover, the current limited availability of high-res music files means this won’t be a problem for the majority of users. 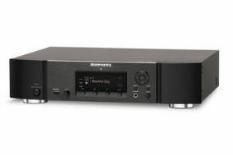 Sonically, if you’re familiar with Marantz’s two channel CD players and amplifiers you’ll know what to expect from this streamer. There’s excitement and drama in spades. Spin Emeli Sandé’s Maybe and her emotional vocals sound natural, full-bodied and full of texture. Switch to a FLAC of Jay-Z’s Who Gon Stop Me and low frequencies hit hard without upsetting the balance of the track. Edges of notes sound resolute and sharply defined and this helps communicate the Marantz’s relatively precise timing. Stream the same song over AirPlay in a more compresed file format, such as a 320kbps AAC file and the same general character is there. Finesse and richness take a slight hit, but the convenience and slickness of the operation can’t be overlooked. Marantz’s M-DAX2 processing is supposed to help bring the best out of compressed audio sources and has three different settings for you to choose. After experimenting with the settings we’d opt for ‘low’ or to leave the processing off altogether. Tracks sound a tad cleaner (you’re more aware of the compressed file's coarseness with it turned off) although highs do sound slightly more prominent. However, this is much more preferable to M-DAX2’s ‘medium’ and ‘high’ settings, which sound overly processed. Use the Marantz digital inputs to stream from a laptop, and the consistency of sound is there. In outright terms, the streamer doesn’t sound quite as accomplished as the Pioneer N50, when used in this manner, but it’s hugely listenable all the same. For the money, the NA7004 is an impressive machine. The blend of features and performance is pretty much spot on.